Fantasy Football Librarian: Contest news from Week 7! Rotoworld's Week 7 Target Report confirms what I was thinking and writing about in my column for the Bruno Boys this week (article will go up in the next day or so) in terms of Chris Chambers. His number of targets per game have actually increased since 2008 but clearly he isn't capitalizing on them...combine that with Norv's comments and Floyd will soon take over giving Chambers little to no fantasy relevance. Take a look at FantasySharks.com's Week 8 projections or FFToolbox's Week 8: Start 'Em for some early Week 8 lineup advice. I'm following the news on Goodell appearing before Congress to talk concussions - I read Malcolm Gladwell's article on the topic in The New Yorker a few weeks ago and definitely learned a little something. What I find most fascinating are the responses to the CBS article I link to here...lots of negativity. Am I naive in that I was expecting football fans to actually care about the long-term health of players? Well there are plenty of 6-1 teams in my monster 96-team FFLibrarian League, but only one team remains 7-0: Dangerous Beans, who posts on this site as EshInPennsyltucky. So when he comments, I say listen up since he clearly knows what he's talking about. Though it pains me a bit to say that since I'm sitting here at 1-6 in that league and yet I'd like to think I know what I'm talking about most of the time. I'll blame my situation squarely on Matt Forte's shoulders but to be honest, I'm sure there are plenty of other reasons. What I have learned from this monster league experience is that 16-team leagues just aren't that much fun for me...when your waiver wire options are truly awful, it takes away a bit of the fantasy joy for me. Last week a great number of you participated in my weekly contest with 365FantasySports.com - love having all that interest, thanks guys! Below you can see the winning roster below from our winner: Tourinct, who rocked the win despite a 1-point performance from Westbrook. Impressive. The point caps game winner this week was repeat player (and winner!) Zrayed. Nicely done to both of you! 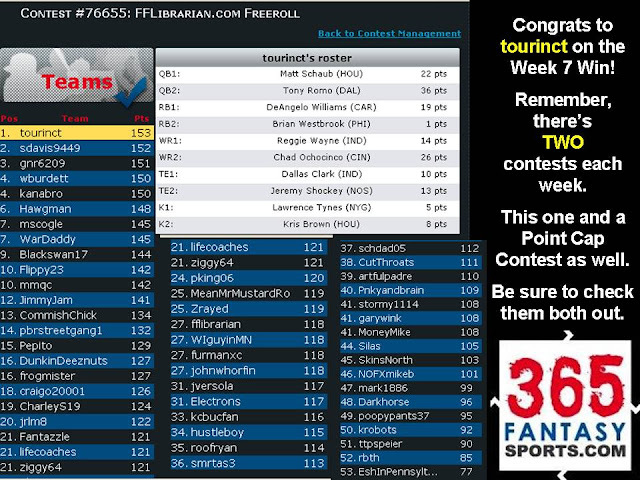 If you'd like to join in on the fun and show off your fantasy football knowledge for Week 8, then feel free to join us! It's free, very quick and easy, and full of smart fantasy minds. Get started here if you haven't participated before. The password this week is 8book - enjoy! I do not believe that people are not concerned about the health and welfare of retired NFL players. Certainly, Mike Ditka and others have brought this to the forefront and have made the NFL and the NFLPA aware that they need to be accountable to those ex-players with health problems. What you are seeing (I believe) is the backlash from people over what our 537 elected officials think is within their purview and oversight and people are fed up with why the Senate and particularly, Sen. John Conyers need to be involved with the NFL and their players. Put another way, people think that our elected officials have much bigger fish to fry than this and that they should be addressing those issues and not grilling Roger Goodell. Those issues might include the economy, two wars, illegal immigration, healthcare and about 100 more items that I (and you) could name. I thought the librarian was referring to the comments about the former players in the CBS article. No one has a lifetime of post concussion syndrome coming to them no matter how much money they made in the NFL. Don't forgot the old players weren't making a fortunate and now a lot of them are broke and facing a lifetime of health issues. It's hard to hate on former players who can't think straight anymore, but some how the commenters at CBS are doing it. Wow, great site this is! I had been looking for targets on the web after Fanball decided to dump the "thrown to" stat out this season. Targets are a vital stat for Fantasy Ballers. I was psyched to see the Targets link, but wow was I dissapointed to only see the breakdown for a handful of teams and some highlights. The comments are pretty telling. Rotoworld, what's going on? Thanks again for this great site. Really cool. Hey Librarian, first, as you know, you're awesome. Second, I got this weird mix of players that I'm not sure how to sort through. I got 2 spots for the following: LT, Sproles, Gonzo, VDavis, Lee Evans(usually I wouldn't even bother with Evans, but with Fitz he seems to have some connection. )K, so my TE and flex (RB,WR,TE) are open, and I am sorta lost. I was even considering putting in both Gonzo and VDavis! Note that the librarian tied with furmanxc down in the results of the weekly league. Thanks John and anon for your comments on the NFL/Congress piece I linked to - yes, anon has it right. I was irritated by the commenters who seemed to be so blase about NFL players; the odd connection between their millions and how we shouldn't care about their health. Just seems wrong to make those statements. Anyway, Mike Spike, glad you like the targets stuff as much as I do. I highly recommend scoping out FFToday's stats section if you want lots of target data: http://fftoday.com/stats/index.htm. Brooklyn, first off, thanks for the love. I think in your situation I would be tempted to start both LT and Sproles against Oakland but I think I'd go LT and Davis. The choice between Davis and Gonzo was hard though - the Colts are definitely a friendlier defense to TEs - so if you're feeling like you've got to go with Gonzo there, go for it. Is that flex your only possible TE spot? David here from http://www.365fantasysports.com. I wanted to take the time to thank all of you who have participated in the FFLibrarian Freerolls. We really believe that the concept of "daily" or "weekly" fantasy football, and all other sports for that matter, is really about to take off and we'd love to have you along for the ride. I ask one favor in return for us hosting the free games: If you like them, tell a friend. For those of you who have not yet experienced the joy of being able to draft an entire new team each week in under a minute or two, come on over! There's no such thing as starting "too late". Each weekly contest is independent and results don't carry over from week to week. Put your pride on the line and let's see how your fantasy knowledge stacks up this week against Sara and her community members. The invitation code for BOTH of her contests this week is '8book'. Her contests are waaaaaay down at the bottom of our contest lobby. Look for #77272 and #77382. Please send any questions, comments (good or bad), suggestions and ideas to me at david at 365fantasysports dot com.